The week that has just ended was exceptionally rich in events. But no media were able to report it, because they had all deliberately masked certain of their number in order to protect the story that was being woven by their government. 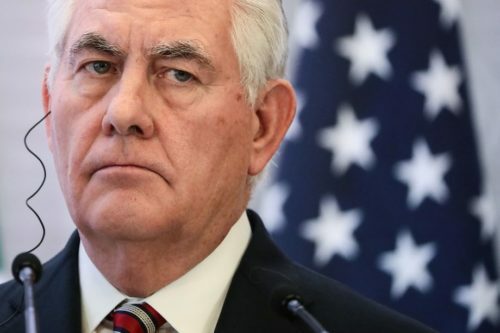 The British government and certain of its allies, including US Secretary of State Rex Tillerson, have attempted to launch a Cold War against Russia. Their plan was to fabricate an attack against an ex-double agent in Salisbury and at the same time a chemical attack against the “moderate rebels” in the Ghouta. The conspirators’ intention was to profit from the efforts of Syria to liberate the suburbs of its capital city and the disorganisation of Russia on the occasion of its Presidential election. Had these manipulations worked, the United Kingdom would have pushed the USA to bomb Damascus, including the Presidential palace, and demand that the United Nations General Assembly exclude Russia from the Security Council. However, the Syrian and Russian intelligence got wind of what was being plotted. They realised that the US agents in the Ghouta who were preparing an attack against the Ghouta were not working for the Pentagon, but for another US agency. 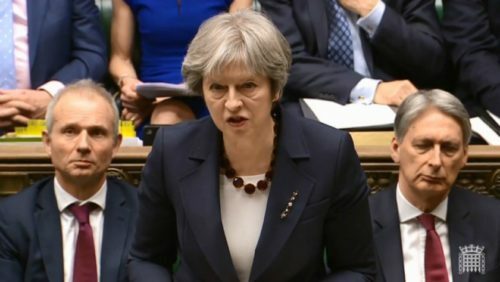 In the House of Commons, British Prime Minister Theresa May violently accused Russia of having ordered the attack in Salisbury. According to her, the ex-double agent Sergueï Skripal and his daughter were poisoned by a military nerve gas of a type “developed by Russia” under the name of Novitchok. Since the Kremlin considers Russian citizens who have defected as legitimate targets, it is therefore highly likely that they ordered the crime. Novitchok is known by what has been revealed by two Soviet personalities, Lev Fyodorov and Vil Mirzayanov. The scientist Fyodorov published an article in the Russian weekly Top Secret in July 1992, warning about the extremely dangerous nature of this product, and warning against the use of old Soviet weaponry by the Western powers to destroy the environment in Russia and make it unlivable. In October 1992, he published a second article (link in Russian) in the News of Moscow with Mirzayanov, denouncing the corruption of certain generals and the traffic of Novitchok in which they were involved. However, they did not know to whom they may have sold the product. Mirzayanov was first of all arrested for high treason, then released. Fyodorov died in Russia last August, but Mirzayanov is living in exile in the United States, where he collaborates with the Department of Defense. Soviet chemist Vil Mirzayanov defected to the United States in 1995. 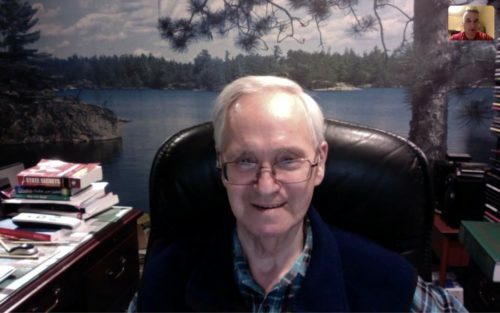 Now 83 years old, he comments on the Skripal affair from Boston. Novitchok was fabricated in a Soviet laboratory in Nukus, in what is now Uzbekistan. In 1999 USA and Uzbekistan agreed to destroy that plant. United States, by necessity, have therefore possessed and studied samples of this substance. They are both capable of producing it. British Minister for Foreign Affairs Boris Johnson summoned the Russian ambassador in London, Alexandre Iakovenko. He gave him an ultimatum of 36 hours to check if any Novitchok was missing from their stocks. The ambassador replied that none was missing, because Russia had destroyed all of the chemical weapons it had inherited from the Soviet Union, as witnessed by the OPCW, which had drawn up a certified report. The Russian side handed out documents from the US staff. They showed that the Pentagon was ready to bomb the Presidential palace and the Syrian Ministries, on the model of what it had done during the taking of Baghdad (3 to 12 April 2003). Commenting on the declaration by Nikki Haley, the Russian Minister of Foreign Affairs, who had always called the attack in Khan Sheikhoun a “Western manipulation”, revealed that the false information which had led the White House into error and triggered the bombing of the Al-Chaayrate air base, had, in fact, come from a British laboratory which had never revealed how it came to possess its samples. Bypassing the official diplomatic channels, Russian Chief of Staff General Valeri Gerasimov contacted his US counterpart General Joseph Dunford to inform him of his fear of a false flag chemical attack in Ghouta. Dunford took this information very seriously, and alerted US Defense Secretary General Jim Mattis, who referred the matter to President Donald Trump. In view of the Russian insistence that this piece of foul play was being prepared without the knowledge of the Pentagon, the White House asked the Director of the CIA, Mike Pompeo, to identify those responsible for the conspiracy. At the request of President of the House of Commons Interior Committee Yvette Cooper, British Secretary for the Interior Amber Rudd announced that MI5 (Military Interior Secret Services ) is going to re-open 14 enquiries into deaths which, according to US sources, “were ordered by the Kremlin”. By doing do, the British government adopted the theories of Professor Amy Knight. On 22 January 2018, this US Sovietologist published a very strange book – Orders to Kill – the Putin régime and political murder. The author, who is “the specialist on the ex-KGB”, attempts to demonstrate that Vladimir Putin is a serial killer responsible for dozens of political assassinations, from the terrorist attacks in Moscow in 1999 to the attack on the Boston Marathon in 2013, by way of the execution of Alexander Litvinenko in London in 2006 or that of Boris Nemtsov in Moscow in 2015. However, she admits herself that there is absolutely no proof of her accusations. The UK communications regulator, Ofcom, announced that it might ban the channel RT as a retaliatory measure, even though RT has on no occasion violated British law. (b) Like London, he thought that in order to maintain Western colonialism in the Middle East, it was necessary to favour Iranian President Cheikh Rohani against the Supreme Leader of the Islamic Revolution, Ayatollah Khamenei. He therefore supported the 5+1 agreement. (c) Like the US deep state, he considered that the swing of North Korea towards the United States should remain secret, and be used to justify a military deployment which would be directed in reality against the People’s Repubic of China. He was therefore in favour of official talks with Pyongyang, but opposed to a meeting between the two heads of state. In New York, the permanent representative of Russia, Vasily Nebenzya, proposed to the members of the Security Council that they adopt a declaration attesting to their common will to shed light on the attack in Salisbury and handing over the enquiry to the OPCW in the respect of international procedures. But the United Kingdom refused any text which did not contain the expression that Russia was “probably responsible” for the attack. Russian ambassador Vasily Nebenzya pointed out that the session had been convened at London’s request, but that it is public at Moscow’s request. He observed that the United Kingdom is violating international law by treating this subject at the Security Council while keeping the OPCW out of its enquiry. He noted that if London had been able to identify the ” Novotchik”, it’s because it has the formula and can therefore make its own. He noted Russia’s desire to collaborate with the OPCW in the respect for international procedures. British Secretary for Defence, the young Gavin Williamson, declared that after the expulsion of its diplomats, Russia should “shut up and go away” (sic). This is the first time since the end of the Second World War that a representative of a permanent member state of the Security Council has employed such a vocabulary in the face of another member of the Council. Sergueï Lavrov commented: “He’s a charming young man. He must want to ensure his place in History, by making shock declarations […] Perhaps he lacks education”. However, Syria is not Iraq and the UN is not the G8 (from which Russia has been excluded because of its adhesion to Crimea and its support of Syria). The United States are not going to destroy Damascus, and Russia will not be excluded from the Security Council. After having resigned from the European Union, then having refused to sign the Chinese declaration about the Silk Road, the United Kingdom thought to improve its stature by eliminating a competitor. By this piece of dirty work, it imagined that it would acquire a new dimension and become the “Global Britain” announced by Madame May. But it is destroying its own credibility. Thierry Meyssan is the founder and chairman of Voltaire Network. Read other articles by Thierry. This article was posted on Wednesday, March 21st, 2018 at 10:27am and is filed under "The West", Brexit, China, Disinformation, Donald Trump, Espionage/"Intelligence", EU, Fake News, False Flag, France, Language, M16, Media, Militarism, North Korea, President Vladimir Putin, Propaganda, Russia, Syria, Theresa May, UK Hypocrisy, UK Media, Ukraine, United Kingdom, United Nations, United States.